I am so excited to share the following image with my readers. I have located and acquired images of U-ta-wa-un and his “wife” while exhibiting at the Paris Universal Exposition in 1867. The image originally appeared in an 1867 French newspaper. Ne-Do-Ba acquired the image through Le Hinchet Books & Prints of France. I would like to thank them for their very prompt service and for making this historically important print available. LES PEAUX-ROUGES A L’EXPOSITION UNIVERSELLE. U-TA-WA-UN (le flèche rapide) de la tribu des Callapooses, en costume de guerre, armé de la lance et du tomahawk. WE-NO-NA (le cygne blanc) femme de U-Ta-Wa-Un, de la même tribu. THE REDSKINS OF THE UNIVERSAL EXPOSITION. U-TA-WA-UN (the fast arrow) of the tribe of Callapooses in war costume, armed with spear and tomahawk. WE-NO-NA (White Swan) wife of U-Ta-Wa-Un, of the same tribe. Before discussing the image, I need to provide some general information so the image itself makes sense to readers. U-ta-wa-un is on both the left and right side of the woman in this drawing. If you look closely, you will see two different artists signatures. The caption says he holds both a lance and a tomahawk, confirming only one man is represented. This tells me the image is a composite of two or three separate images. It also suggests the individual images have been altered to some extent to make them blend together seamlessly. I have no way of knowing if other liberties have been taken in creating this composite group image. This does create some concern for the accuracy of the image. I will continue to search for additional images in a effort to verify the accuracy of costumes being depicted. He appears in war regalia. He is married to We-no-na. She appears in more conservative regalia. They are both from the Callapooses tribe. They represent themselves as American Indians. Do I want to believe all of the above? — NOT! How do I know this is the same man I have been tracking in the U.S.? I know I have the correct man because his right hand is missing in both images. I have documents from other time periods referring to U-ta-wa-un as having a missing hand, with one of them suggesting it occurred about 1865 or 1866. Additional proof this is the same man would be wonderful, but this is sufficient evidence for me to continue this line of research. Since both artists did include the missing hand in their drawings, I suspect the facial depiction would be reasonably accurate as well. The fact the face is nearly the same in both images despite being drawn by two different hands also suggests this is probably a reasonably accurate depiction of the man’s face. I am not sure how much faith I want to put into the accuracy of other details in the images, but there are some interesting generalization I would like to point out to my readers. The outfits U-ta-wa-un is wearing in this image appear to be costumes put together for a show. Neither of them appear to me to be authentic to any North American Tribe that comes to mind. 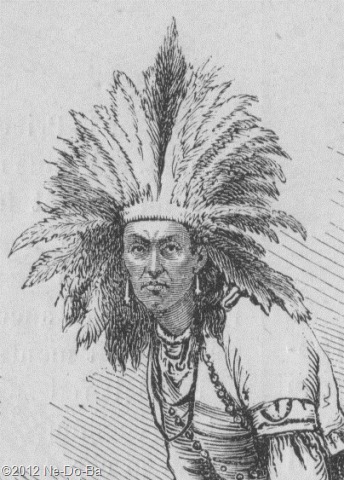 I found an illustration of a “fringed draped apron” that appears very similar to what he is wearing around his waist, but the illustration did not provide an information about what tribe(s) used the style. The headdress style would be loosely classified as “Plains” but the feathers are clearly not the Eagle feathers used by Plains tribes. The lance is an obvious prop and looks like something a Roman Legionnaire might carry. The nose ring is curious. I would expect to see a great deal of bare skin, but he appears to be completely clothed in both images! Perhaps his European audience would not approve of any nakedness. please take the time to leave a comment. The woman in the center appears to be wearing a much more conservative and traditional style of Native clothing. She wears a long jacket or blouse, a ribbon skirt, and leggings. I would categorize the clothing as Northeastern regional or perhaps Great Lakes. There are, however, some problems with this assessment. The ribbon skirt appears to be rather full, whereas skirts of the Northeast are more often straight. I see French curves where I expect to see traditional double-curve, floral, or geometric designs around the bottom of the shirt and the border of the jacket and sleeves. Is this a case of artistic license on the part of the artist or has she adopted French curves for the Expo? The hatchet in her hand is very unnatural looking. It may be drawn in “after the fact”. Her headdress is certainly not typical of the Northeast. It reminds me of the otter skin turbans worn by the men of some Great Lakes tribes. 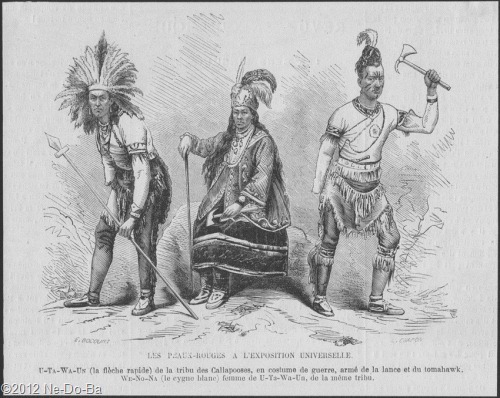 I did find an illustration titled “Dance of the Mandan Women” on page 120 of “Encyclopedia of American Indian Costume” which shows Mandan women wearing “fez-like” headdresses with feathers very similar to the one worn by Wa-no-na in the illustration above. Wikipedia also has this illustration and assigns a date of 1840-1843. Another source places the illustration as circa 1832. The headdress appears to be part of a special ceremony. I have not found this headdress in any other place. My overall opinion – Wa-no-na appears to be herself and is very likely a real Native woman wearing the clothing of her culture, although she may be modifying it to please her European audience. U-ta-wa-un, on the other hand, appears to be dressed for putting on a show to please his audience. Aspects of their costumes may perhaps be attempts to copy something from a George Catlin (or similar artist) painting well know to the public of that era. Of course, knowing more about the circumstances of the poses and the styles of the artists would be very useful, but this is probably not the type of information that will be easy to find, if it even exists. Could this be Marleah Kanistanaux? I have a lot more research to do before declaring it so. I am not concerned about the claim she is the wife of U-ta-wa-un, since it could easily be part of the show. However, I am encouraged by this image, since it does appear to depict a Native woman with northeastern Native roots. What about the name, We-no-na? Well, I Googled it and this is what I learned. A book was published in 1849 by Mary H. Eastman describing the Native people associated with Fort Snelling. The book included a story about the naming of Wenona’s Leap or Maiden’s Rock in Lake Pepin. The story is the classic “Indian” love tragedy where an unfulfilled lover leaps to their death. This appears to be the earliest publication of the name. The transcription I found online does not put dashes in the name but all the later spin-offs do put the dashes in. According to a news clipping, in June of 1850, Sergeant Thomas of Fort Snelling raffled off two portraits he had recently painted. One was of “We-no-na”, whom he described as “the most renowned of the Dakota belles.” I was unable to determine what happened to the painting. Did he paint a real woman or just illustrate the old legend? I found the name We-no-na in another version of the fictional “Indian” love story of Lake Pepin and how We-no-na’s Rock received its name. It appears in the book titled “The Atlantic Souvenir: For 1859.”, published in New York in 1859 and is essentially the same story told in 1849. The name appeared in at least two books before 1860, so the public was definitely exposed to this “Indian” name and it perhaps had some renown by 1867. About 1862 or 1863, a photograph was taken of a very young Sioux woman, said to be the daughter of Chief Red Iron. Her name was We-no-na (the First Born). This Carte de visite is currently owned by the Massachusetts Historical Society. A different image of the same woman is owned by the Military and Historical Image Bank and is dated 1864. I have been unable to determine if either photo had widespread accessibility to the public before 1867. She certainly is not the same woman of the legend and appears to be younger than the woman in the above image from Paris. However, she is a very real person who was most likely alive in 1867, so can not be totally ruled out without more research. I found an 1884 New York Times article discussing a “Indian” fortune teller traveling under the name “We-no-na” with a medicine man named “We-Ho-Haw-Yum” (a U-ta-wa-un copy-cat ;-). At first I thought this might be U-ta-wa-un and Marleah, but the article eventually identified the couple as Mr. King and Annie King. She is described as a “maiden” rather than an “old maid”, so I doubt she could be the woman in Paris in 1867. Add an “h” to the end of Wenona and you have a canoe manufacturer (www.wenonah.com) located in Winona, Minnesota. Wikipedia claims the town was named after “Princess We-Noh-Nah”. Give me a break – time to clean up your act folks! So, it is a real “Indian” name, but that does not mean it is the real name of the “Indian” currently using it. It is a Dakota name, but the woman in the image does not strike me as a Dakota woman. What do you think? I certainly have a great deal more research to do on this event and the people involved. I thank Creator for Google Translate because I suspect most of the good resources will be in French. I don’t know how much I will be able to dig up, or if I will find answers for any of my hundreds of questions, but I do know I wouldn’t have gotten this far without the internet. Let’s see how far it will take me on this adventure.